Born: 15 March 1713, Rumigny, Ardennes, France. Died: 21 March 1762, Paris, France. 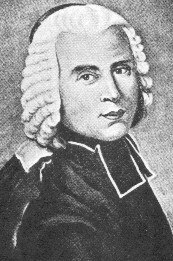 Nicolas Louis De la Caille studied in the humanities at the College of Lisieux, and subsequently followed a three year course in theology and philosophy at the College of Navarre. He qualified as Master of Arts and Bachelor of Divinity, was ordained deacon, and called Abbe. However, having by then developed an interest in mathematics and subsequently in astronomy, he did not pursue a career in the church but in 1736 was appointed by the astronomer Jaques Cassini to do computational work at the Paris Observatory. He made his first astronomical observations in May 1737, and the next year assisted in a survey of the French coast from Nantes to Bayonne. During 1739-1740 he participated in the re-survey of an arc of meridian near Paris with Cassini de Thury (son of J. Cassini). The latter's official account of the work in 1744 finally convinced everyone that the earth is flattened at the poles. Meanwhile De la Caille had been appointed professor of mathematics at the College Mazarin (Paris; later the Institute de France) in October 1739, and the rest of his life was spent in the service of this institution. In 1741 he published notes on his course in mathematics and subsequently compiled similar manuals on mechanics (1743), astronomy (1746) and optics (1750). Several French editions of these works, as well as translations into other languages, were published. The college provided De la Caille with an astronomical observatory and equipment which he used, among others, to accurately time eclipses, occultations and conjunctions, and to ake observations of comets. He was admitted to the Academie des Sciences in 1741, and that same year contributed his first paper to its Memoires, dealing with the differential formulae of the spherical triangle and their application to the treatment of observational and instrumental errors in astronomy. His subsequent research involved an improved theory of the sun's apparent motion, based partly on his own observations. The work included improved determinations of the rate at which the obliquity of the ecliptic was decreasing, the annual progression of the sun's apogee, the length of the tropical year, and the eccentricity of the earth's orbit. Several papers relating to this work were published in the academy's Memoirs from 1742 to 1757. The solar tables based on this work, published in 1758, were the first to take into account the aberration of light, nutation of the earth's axis, and perturbing effects of the moon and planets. A textbook of astronomy by him was translated into English as The elements of astronomy... (London, 1750, 390p). De la Caille also made many other astronomical and physical observations. Adopting a new procedure involving the skilful combination of observations of the same 160 stars from both Paris and the Cape, he determined the effect of atmospheric refraction on stellar altitudes and in 1755 published improved correction tables. With the cooperation of the Academie des Sciences and astronomers in Europe he was responsible for a series of simultaneous observations of the moon's meridian altitude at the Cape and at Berlin (almost on the same meridian) in order to obtain an improved estimate of the moon's horizontal parallax, and hence its distance from the earth. The results were published in 1761. Again in cooperation with European astronomers, he carried out observations of Mars and Venus at the Cape and, combining his results with those of his colleagues, obtained new estimates of the solar parallax, and hence of the distances between the planets and the sun. The results were published in 1760. His observations of bright reference stars at the Cape and at Paris formed the basis of a catalogue of the positions of 307 of the principal stars of both hemispheres, published in 1755. This catalogue long retained its value and was reprinted in 1833. His Cape observations included the positions and brief descriptions of 42 nebulous objects of the southern hemisphere, published in 1755. Considered to be of particular importance by members of the Academie des Sciences were his experiments on the determination of longitude at sea, for which he recommended a revised procedure based on observations of the position of the moon. His procedure for calculating and correcting the results of such observations were later included in directions to navigators. Using his standard clock and a pendulum, he determined that the length of a seconds pendulum at the Cape was about 1 mm shorter than at Paris. He determined the longitude of Cape Town more accurately than before, by timing occultations of Jupiter's satelites. He surveyed Table Mountain from a baseline on the beach and used a barometer to determine the height of various landmarks. He determined the local magnetic elements, and made some tidal observations. He also kept a daily meteorological record. A paper published in the Memoires of the academy in 1755 summarized and discussed the meteorological observations he had made during the year from 1 July 1751 to 30 June 1752. More than a century later, in 1864, Thomas Maclear* considered this paper important enough to have an English translation, "Meteorological observations, or description of the winds and seasons at the Cape", published in the Cape of Good Hope Blue Book (pp. KK10-KK16). While completing his observational programme De la Caille started preparations for measuring an arc of meridian at the Cape. With the help of Captain E.B. Muller, an artillery officer and engineer provided by the government, and his host Bestbier, he proceeded northwards in September 1752 to select a suitable site for the northern limit of his arc. He chose a spot on the farm Klipfontein, near the present village of Aurora, and accurately measured its latitude. It proved to be almost one and a quarter degrees north of his Strand Street observatory. In surveying the arc he used two large triangles with a common base and with their respective vertices at klipfontein and Strand Street. On the Darling Flats he accurately measured a 13 km baseline, which was linked geodetically to the two triangles. The work was meticulously carried out, but the result (111.17 km per degree) did not conform to the expected value for that latitude (111.30 km per degree) based on geodetic work in the northern hemisphere. It appeared as if the earth's southern hemisphere was peaked, rather than flattened, at the pole. Only some 90 years later did Thomas Maclear* trace the anomalous result partly to an error in the supposed length of the arc, and partly to gravitational disturbances of the plumb line, particularly at Klipfintein. None the less De la Caille was the first to carry out a geodetic survey in southern Africa. His triangulation is shown on a map of the Cape of Good Hope that was included in his journal of the expedition. De la Caille finally left the Cape on 8 March 1753. On orders from the king of France he proceeded to L'isle de France (Mauritius) to survey and map the island. He eventually reached France in June 1754 and spent his remaining years mainly in analysing and publishing the results of his expedition. Among his publications during these years were Astronomiae fundamenta, novissimis solis et stellarum observationibus stabilita Lutetiae in Collegio Mazarinaeo et in Africa ad Caput Bonae Spei... (Paris, 1857, 243p), and tables of logarithms (1760). Sir David Gill* later described De la Caille's expedition to the Cape as "one of the most memorable, successful and useful scientific expeditions ever undertaken" and De la Caille himself as "one of the most earnest and active astronomers that ever lived.... He laid the foundations of sidereal astronomy of the Southern Hemispher; he did that great work in a single year at Strand Street, Cape Town; he won the love and friendship of all who knew him." Armitage, A. The astronomical work of Nicolas-Louis De Lacaille. Annals of Science, 1956, Vol. 12(3), pp. 163-191. Cape of Good Hope. Blue Book, 1864, pp. KK10-KK16 (Translation of De la Caille's paper, "Meteorological observations..."). De la Caille, N.L. Travels at the Cape 1751-53, an annotated translation of Journal historique..., translated and edited by R. Raven-Hart. Cape Town: Balkema, 1976. Gill, D. The Cape astronomers and their work. A lecture delivered at Kimberley ... in connection with the Kimberley Exhibition. Cape Town: Murray & St Leger, 1892. McIntyre, D. An astronomical bi-centenary: The Abb� de Lacaille's visit to the Cape, 1751-1753. Quaterly Bulletin of the South African library, 1951, Vol. 5(3), pp. 79-90. Moore, P. & Collins, P. The astrononomy of southern Africa. Cape Town: Howard Timmins, 1977. Smuts, M.E. A history of geodesy in South Africa. South African Survey Journal, 1926, Vol. 2, pp. 68-76, 118-124, 167-179, 211-218.